Leading training simulator provider ThoroughTec Simulation will be demonstrating their advanced fourth generation CYBERMINE simulator at the upcoming International Mining and Resources Conference (IMARC) in Melbourne, Australia. To be held 23-25 September at the Melbourne Convention & Exhibition Centre, IMARC is one of Australia’s premier international mining events. ThoroughTec will be showcasing the simulator on the PwC Australia stand as part of the professional services firm’s strategy to show its diversity and commitment to mining. Greg Lew, Executive Vice President and Director of Global Business Development at ThoroughTec said it was an honour to be invited by PwC, a firm with a long and distinguished history of providing services to the mining segment, similar to their own commitment to the global mining industry. 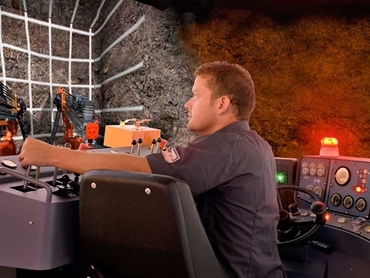 CYBERMINE simulators are designed to improve safety and productivity for mine vehicle operators in surface or underground mining environments. Recommended for training and evaluating novices in the proficient operation of heavy machinery, providing a new-recruit screening system and effective refresher training for experienced operators, the training simulator can also be used to train operators on how to react in emergency situations, which is not possible on the actual mining equipment. The 4th generation CYBERMINE simulator features an accurate replica of the vehicle’s cab, a motion platform with three or six degrees of freedom and a 270° or 360° panoramic, high resolution projection display system with surround sound audio. A feature rich instructor station controls all aspects of training and evaluation in real time. ThoroughTec will also be demonstrating their Sandvik DD420 underground drill rig simulator at IMARC. Simulators for this popular drill rig model are being employed at mines and training facilities in Australia, Canada, Indonesia, South Africa and the USA. ThoroughTec offers simulators for over 25 Sandvik models. ThoroughTec offers one of the broadest ranges of simulated vehicles in the industry for all the major OEMs including Atlas Copco, CAT, Joy and Komatsu.